Besides "Have you been to Tojo's? ", one other question I get asked a lot is "Have you been to Jiro's sushi restaurant? The really famous one in Japan?" While trying Sukiyabashi Jiro is on my bucket list, I am quite the procrastinator when it comes to making travel plans. Reservations at Sukibayashi Jiro are typically made at least 6 months in advance. Unfortunately, by the time I confirmed my travel dates to Japan, there were less than 6 weeks before departure. Not only were seats at Sukiyabashi Jiro long gone, but so were the seats at pretty much every other Michelin-starred restaurant in Japan. Not wanting to give up my dreams of eating sushi, I looked around for a close substitute and found Jiro Sushi & Ramen. 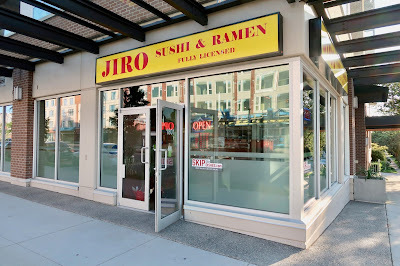 Jiro Sushi & Ramen is a new Chinese-operated Japanese restaurant with a clean interior featuring marbled tables and slim wooden chairs. Opening the menu, I found a good assortment of special rolls and an array of moderately priced items. There were also some cheaper options in terms of rolls and nigiri. One thing I lack in life is martial arts skills, so to make up for this deficiency, I went for the Kung Fu Roll, which consisted of spicy tuna, avocado, cucumber, salmon, seared tuna, grilled veggies, tempura oba, onions, masago, and orange. With its bright gold and red colours, the roll looked perfect for a Chinese New Year celebration. The spicy tuna inside the roll was pleasantly soft, and the orange slices were juicy and sweet (even though they weren't really part of the roll). Unfortunately, the obnoxious amount of hot chili sauce obscured the flavours of virtually everything else, and the roll was quite rice-heavy. The Tai Nigiri was not too chewy, but not too flavourful either. 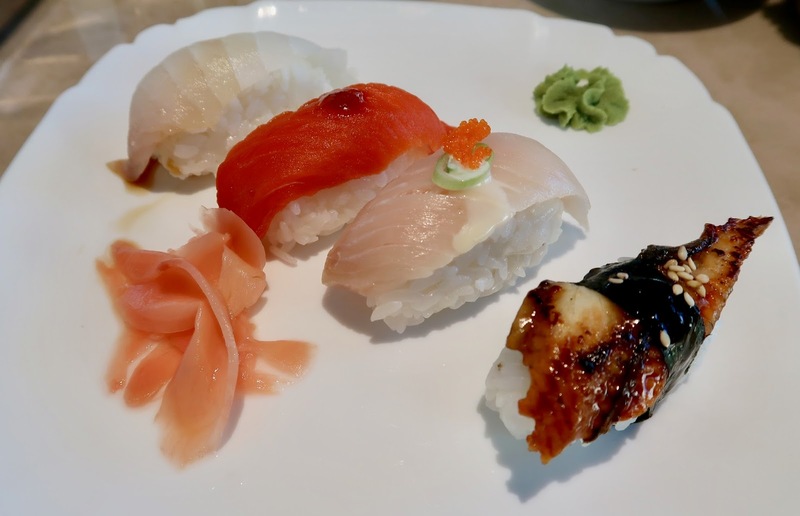 The Sockeye Salmon Nigiri came with moderately fresh sockeye salmon, while the Toro Nigiri was soft and neatly constructed. The Unagi Nigiri, at $1.45 a piece, was the cheapest unagi nigiri I have come across in all of Greater Vancouver. It fared alright, though the thin cut dampened its impact. The sushi rice was also quite tightly packed and prevented me from enjoying the softer textures of the toppings. 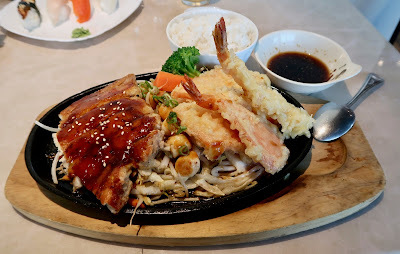 The Chicken & Scallop Teriyaki came with an option to add $2 for a few pieces of tempura. The teriyaki was the best-executed dish of the whole dinner, with juicy chicken and sweet scallops. If anything, the scallops could've been a little less well done. The tempura came with 2 prawns and 3 pieces of sweet potato. The batter could've used a little more crispiness, but the tempura was rich in flavour. The frying oil used to prepare the tempura was not overused. The service during my visit was adequately friendly. However, my overall impression of the restaurant was that nothing truly stood out. Although there were no absolute blunders, my dinner lacked a dish enticing enough for me to come back for more. If I were looking for budget sushi, there are also cheaper options in the area. Will Jiro Sushi & Ramen find a way to captivate hearts like the famed Sukiyabashi Jiro in Japan?